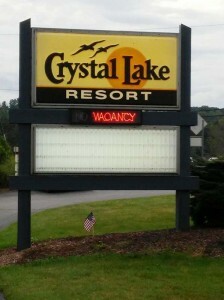 Crystal Lake Resort sign. Image courtesy of Elizabeth Kinsey. Jim and I have spent summer time on Crystal Lake at the Crystal Lake Motel and Resort for decades. Sometimes we’re there for a week. Other summers we spend just a few nights. There are numerous places to stay in the area, but this is our favorite. Crystal Lake in Beulah is about two hours north of Grand Rapids. M31 makes a great drive through several lake towns, though you’re inland a on that route. We love Beulah because it is centrally located for so many of Michigan’s treasures. 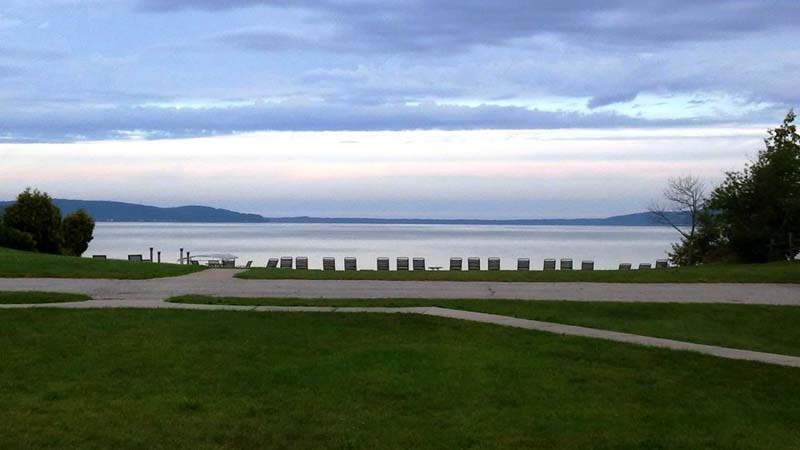 Once in Beulah, take M22 up to quaint Leland, summery Sutton’s Bay, then on to Traverse City and back. You can head to Frankfurt, the beach, the lighthouse, charming Main Street. Drive to Sleeping Bear sand dunes; appreciate the scenes overlooking Lake Michigan. Climb the bear if you’re inclined. Visit Point Betsy Lighthouse. 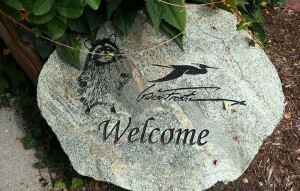 Welcome at the Gwen Frostic studio. Image courtesy of Elizabeth Kinsey. 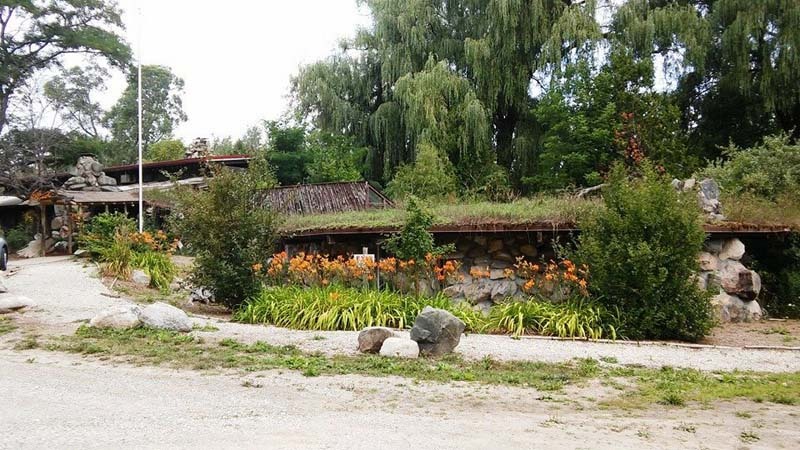 Near Beulah is the studio of the late artist Gwen Frostic, a Michigan icon. 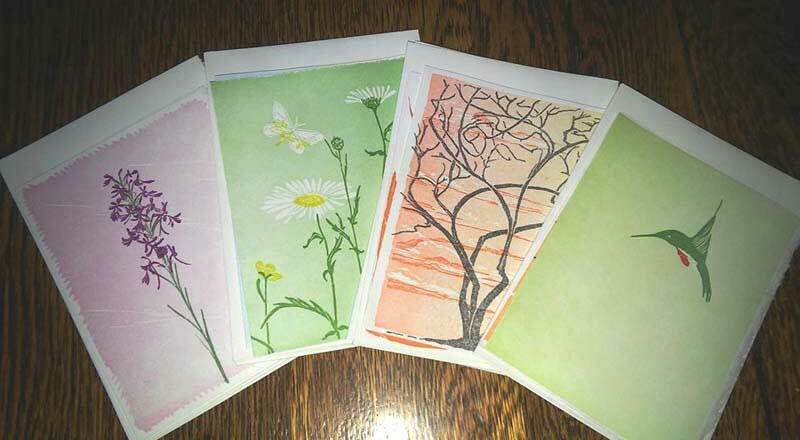 Pick up beautiful block print stationery, napkins, cards and books of poetry by the artist. See the printing press. Across the road stop at an interesting alpaca farm. Gwen Frostic studio. Image courtesy of Elizabeth Kinsey. Gwen Frostic cards. Image courtesy of Elizabeth Kinsey. Crystal Lake itself is a clear blue relaxing beauty. It’s perfect for swimming. If you’re up for more of a challenge a more refreshing dip, Lake Michigan beaches abound in that area. You can tube/canoe/kayak rivers, enjoy freshwater fish and ice cream, hike, whatever your heart desires in this Michigan goldmine. 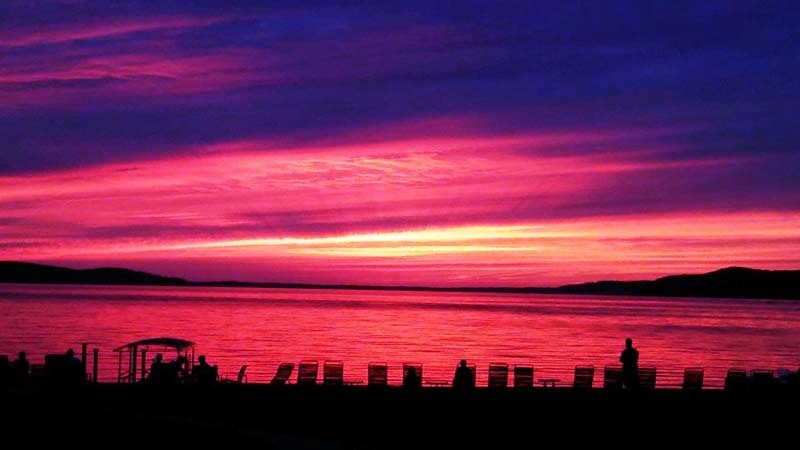 Just make sure you’re outside every sunset to enjoy the masterpieces of our favorite Artist!